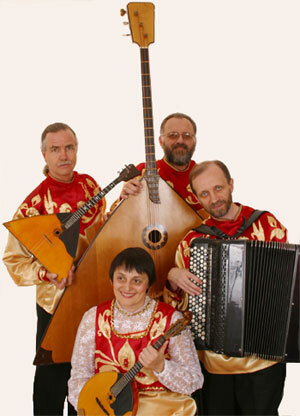 Founded in 1995, the Firebird Balalaika Quartet has built a reputation as a unique, dynamic and accomplished chamber ensamble performing on traditional Russian instruments. The group performs on the domra, the balalaika, the bayan. The quartetï¿½s repertoire ranges from traditional Russian and Eastern European songs, to well known classics and contemporary works. In addition to touring extensively in the US and abroad, Firebird has performed on a number of stages including the Peninsula Music Fair in Palos Verdes, the John Anson Ford Amphitheater in Los Angeles, the Palace of Fine Arts Theater in San Francisco, the Fechin Institute in Taos, the Hoover Auditorium in Silverlake, Ohio, the Luther Burbank Center in Santa Rosa, the Pasadena Civic Auditorium, the Pioneer Center for the Performing Arts in Reno, the Sounds of LA concert series at the J. Paul Getty Museum, the Norton Simon Museum in Pasadena, and the Ronald Reagan Library in Simi Valley. Iryna Orlova, a virtuoso of the domra and graduate of the Kiev Conservatory, is the groupï¿½s music director. Iryna began playing the domra at age ten, going on to win the 1978 Ukrainian Stage Performerï¿½s Competition in Zaporizhia, and the 1979 USSR Stage Performerï¿½s Competition in St. Petersburg. Iryna was a soloist in the internationally acclaimed Ridni Naspivy ensemble with the Kiev State Philharmonic Society and is a national laureate of the All-Ukrainian Folk Musician Competition. She has toured throughout Ukraine, Russia, Europe, The United States, Canada, and Mexico. Anatoliy Mamalyga is the principal arranger for the Firebird Quartet as well as an accomplished Bayan player. He was the music director and conductor of the Ridni Naspivy ensemble, and is currently an Honored Artist of Ukraine and laureate of the 2000 Second International Golden Accordion Competition in New York. Peter Rothe possesses a deep knowledge of the balalaika, having studied with Emanuil Shyenkman and toured with the Odessa Balalaika Ensemble, which performed at the Hollywood Bowl, the Beckman Auditorium, and the Ambassador Auditorium, as well as recorded the album ï¿½The Art of the Balalaikaï¿½ with Nonesuch Records. In 1994 Peter became a founding member of the Los Angeles-St. Petersburg Russian Folk Orchestra. Tom Barnes, a graduate of the California State University Dominguez Hills, began his musical journey at age eleven when he received his first guitar for Christmas. He has since played in a variety of folk/rock ensembles and church choirs throughout Southern California. In 1994 Tom became a founding member of the Los Angeles-St. Petersburg Russian Folk Orchestra when Peter Rothe encouraged him to take up the contrabass balalaika, the largest member of the balalaika family. The Firebird Quartet presents a multifaceted performance featuring Russian dancers, vocalists, and specialty Russian and Ukrainian wind and percussion instruments. Soloists include soprano Valentina Stepova, a Peopleï¿½s Artist of Ukraine and soloist of the Kiev Opera, baritone Boris Zhaivironok, a Peopleï¿½s Artist of Russia, and tenor Alexander Agamirzov among others.